A sweet, retro popcorn maker which air pops corn instead of using oil for a super healthy snack. What more could you want? The perfect gift for a girly hostess with the mostest, this Vom Fass vodka is pink with 22-carat gold flakes and comes in a diamond-shaped bottle. I always sway more towards cheese slates but I love the slightly retro oak base and glass dome for adding some gravitas to a cheese board. Duck & Waffle is undoubtedly one of the best restaurants in London, thanks to the vision of Executive chef Dan Doherty. A personal favourite, I’ve eaten there more times than I can remember. With dishes like spicy ox cheek doughnut and the signature dish duck & waffle, this is a true foodie’s choice. Dan’s cookbook contains 100 mouth-watering recipes for breakfast, brunch, small plates, main courses, desserts and cocktails. 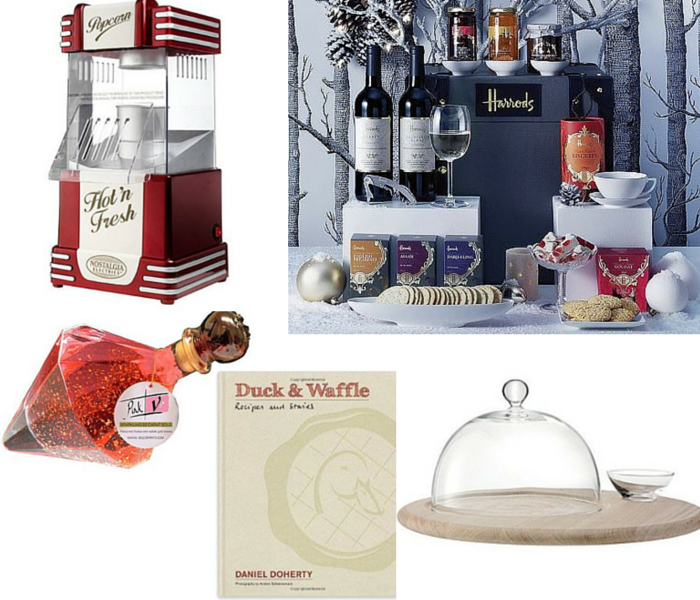 This is a foodie’s essential care package, containing the most popular teas, biscuits, jams, marmalades, crackers and relishes from Harrods’ famed food halls as well as two bottles of wine. What more could you want?